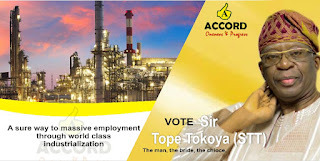 Sir Tope Tokoya, politically known as STT, of ACCORD, Ogun State has emerged along with 26 candidates for the State Assembly, 9 candidates for House of Representatives and 3 candidates for the Senate at the party's primaries held on Friday, 5th October, 2018 at the party's Ita-Oshin, Abeokuta State Secretariat. In his acceptance speech, he appreciated the State Chairman of the party, Elder Isiaka Amusa, the state exco and the entire membership of ACCORD for their support and understanding. He also specially showed his gratitude to the national officers, Barrister Oke & Chief Babarinde for their show of impartiality and integrity at the primaries. He urged all other candidates and ACCORD members to join him to work for victory at the 2019 elections. He promised to run a government of PEOPLEFIRST with lits of emphasis on Youth & Women emancipation. He also promised to return the Local Government administration to its constitutional mandate as the closest government to the people.